While IGNITE! is known for being a music festival that features awesome local bands live, that is not the only thing we offer. We have various other activities you and your friends can take part in. So, aside from jamming out to your favourite bands live at IGNITE!, here are some things you can do too. Want to treat yourself to something? Then IGNITE! Village is the perfect place for you to go to. We have various vendors for you to check out and you will definitely be able to find something you would like. We have awesome vendors coming in. Check it out below! With nine different food and beverage vendors, you will have different options to choose from. Getting thirsty? Get yourself a refreshing drink at Brew Up! or Red Bull. If you’re hungry, we have 21 Sliders that sells good old burgers. If you’re craving for some potatoes, The 6ixs Rosti and The Daily Menu Co are the places go. Or maybe in the mood for some tacos? Fed By The Ravens will definitely satisfy. However, it is limited to the first 200 people and is only valid until the 31st of July 2018. So, if you see something that catches your eyes, use the code ‘IGNITEMYFIRE’ for the 15% off before the discount ends. If you are a sunglasses kind of person, we have a promo code for The Moonshade Co. Treat yourself by buying shades. Use the discount code ‘IGNITE20’ and get 20% off PLUS free shipping! Check out their site! 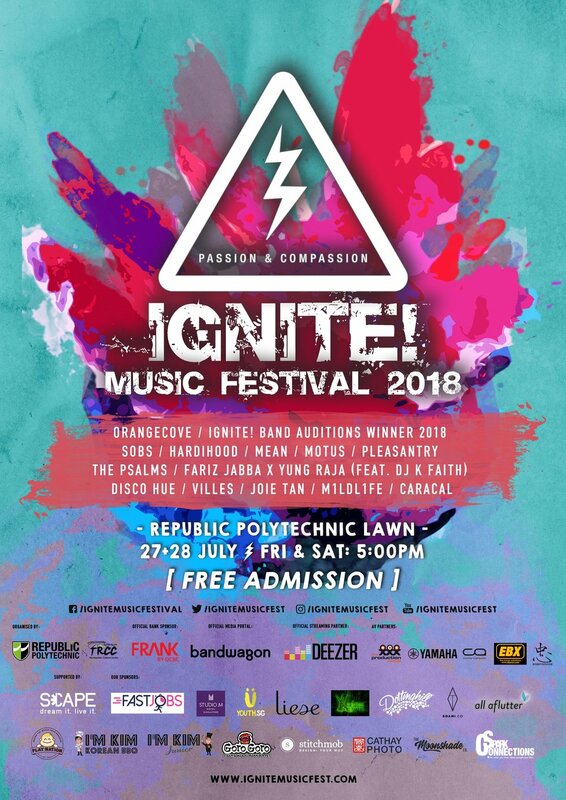 You can also support the bands performing by buying their merch from IGNITE! Merchandise booth! Get decked out in your favourite band’s merch and spot out fellow fans. Besides paying your expenses with cash, you can also go cashless by using OCBC’s Pay Anyone! All you need is an OCBC account and the app and you’re all set to go. If you don’t have an OCBC account, just head down to the FRANK by OCBC booth and sign up for it. There are various card designs so you can pick one that fits your personality! Music is not the only entertainment we have! Our #IGNITEBESTCREWEVER will be walking around with mini-games for you to play. And of course, there are prizes to be won! Interested? Here are the three mini-games we will be having. How to play it: Strap the tissue box onto the player’s back and fill it with 8 ping pong balls. Shake and dance around until all the balls have fallen out of the tissue box. No using your hands and no laying down. How to play it: Players have to use a chopstick to pick a cotton ball and drop it into the bowl which will be placed on their heads. More cotton balls in the bowl after 1 minute, the more rewards are given. How to play it: One player must wrap another in IGNITE! tapes. The first player to get their entire body wrapped with IGNITE! tapes is the winner. The winners of these games will walk away with a Picnic Mat sponsored by Spark Connections. Nothing like a Picnic Mat to top your Festival experience and laze on our Lawn. One thing you must do during IGNITE! is take a picture (or a video) to remind yourself of the good times you had. And we have the props you need to show your friends that you are at IGNITE! There will be a roving photobooth where our Guerrilla marketing team will be walking around with a small prop so that you and your friends can take a picture on the spot. There will also be Dollop photobooth in Peanut Butter where you can take a picture and have it printed out for $2! Lastly, the IGNITE! Team has also provided a LED fixture that will be on-site for your own OOTD moments during your free time if you have any. Don’t forget to check it out. 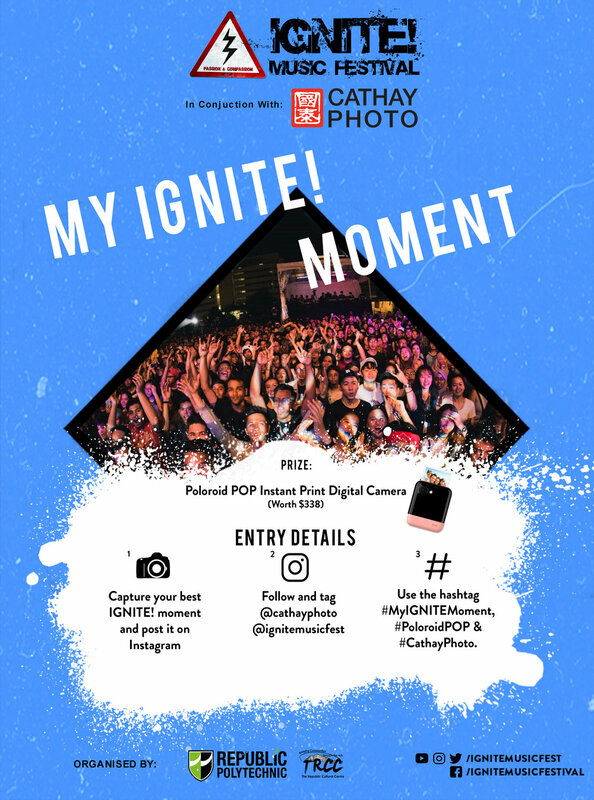 Psst, if you do take a picture, do use the hashtag #IGNITEMF18! We would love to see it! Did not manage to participate in #IGNITELipSync18 and #IGNITESwitchUp? Don’t worry, we got your back. On the 27th and 28th of July, we will be having three competitions with attractive prizes! Have you heard of a photo competition that requires you to stay in bed? Well, that is what #IGNITESleepover is about! All you have to do is take a picture on a bed that can be found at the IGNITE! Festival Village with a pose that captures the essence of IGNITE! The creativity is all up to you! Follow the details as listed on the board at the Photo Competition site. Participants have to be 18 and above in order to be qualified for this competition. Profanity and any improper poses will result in disqualification from the competition and be asked to be taken down from media platforms. This competition is exactly what the name is! We would love to see what is your favourite IGNITE! moment is. It could be anything that is happening during IGNITE! The people, the food, the performance, it’s all up to you! If electronic dance music is more your thing, don’t worry, we got you covered. Come chill with the guys from Republic Polytechnic’s very own Electronic Music Production (EMP) IG! Located away from the main stage of the Festival Chill Out zone, SPINCITY is a great place to go to if you want to enjoy the night breeze while still enjoy great music. You do not want to miss out on all of these! Bring your friends along and have a great time at IGNITE! 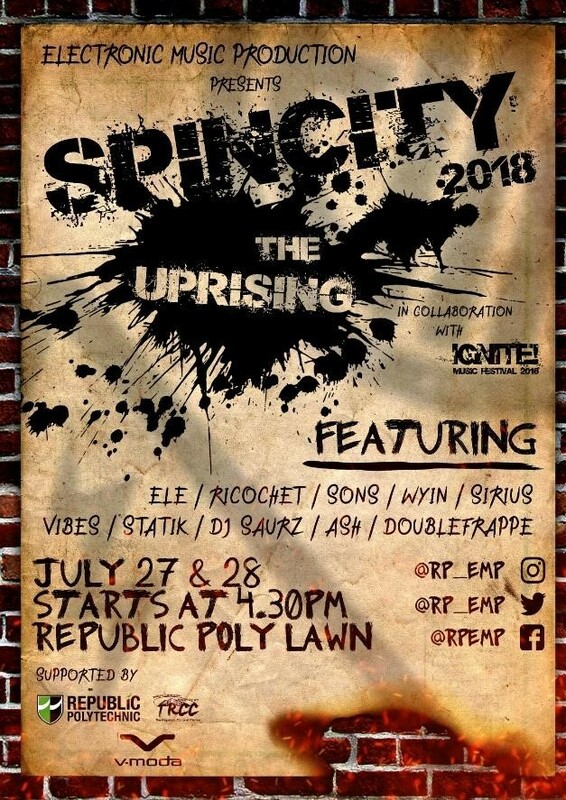 Music Festival 2018 on the 27th and 28th July at Republic Polytechnic! For your safety and the safety of others, IGNITE! Music Festival will be conducting bag checks and security screening. To avoid long queues, we suggest you to dress light and refrain from bringing bulky bags. We apologize for any inconvenience caused. See you at the Festival!